William Carter is reworking the most famous translation of À la recherche du temps perdu. But will it really make Proust more accessible? 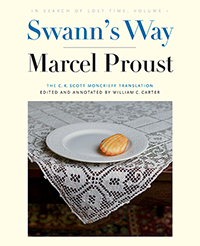 William Carter, in the first volume of his epic ongoing Proust edition for Yale University Press, characterizes Proust’s seven-volume series À la recherche du temps perdu as “considered by many to be the greatest novel of the 20th century and perhaps of all time.” The series — Du cote de chez Swanni (Swann’s Way), A l’ombre des jeunes filles en fleurs (In the Shadow of Young Girls in Flower), Le Cote de Guermantes (The Guermantes Way), Sodome et Gomorrhe (Sodom and Gomorrah), La Prisoniere (The Captive), Albertine dispartue (The Fugitive), Le Temps retrouve (Time Regained) — was written by Proust between 1913 and 1927 and has been confounding, transporting, and flattening readers ever since. 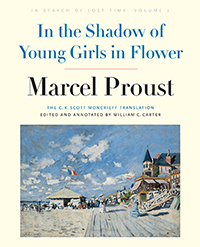 But it’s not actually À la recherche du temps perdu that sits at the heart of Carter’s work (two volumes of which have appeared so far, Swann’s Way and In the Shadow of Young Girls in Flower); he’s not, as you might think at first, offering a new translation of Proust’s books. Instead, Carter has embarked on a thorough revision and annotation of an English-language translation. The translation in question is of course the one done by Scottish author and translator C.K. Scott Moncrieff between 1922 and his death in 1930. Moncrieff was a passionate fan of Proust’s project, and he gave his English-language translation the Shakespearean title of Remembrance of Things Past. 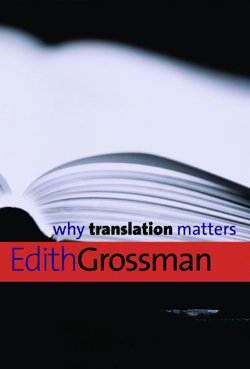 It would be difficult to find a single translation of any work of fiction that casts such a long and deep shadow. As monumental as Proust’s series is, it is matched and even exceeded by the monumentality of the work Moncrieff created. Indeed, more than a few writers, Joseph Conrad among them, considered it to be one of those rare instances when the translation is superior to the original. Swann’s Way: In Search of Lost Time, Vol. 1 by Marcel Proust, translated by C.K. Scott Moncrieff, and edited by William C. Carter. In the Shadow of Young Girls in Flower: In Search of Lost Time, Vol. 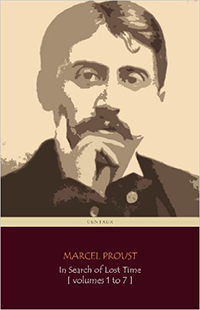 2 by Marcel Proust, translated by C.K. Scott Moncrieff, and edited by William C. Carter. In Search of Lost Time, Vols. 1—7 by Marcel Proust, translated by C.K. Scott Moncrieff. If such remarks — and they are typical of many, many more — give you the vague impression that hyperbole has been an attentive handmaiden of both Proust’s books or Moncrieff’s translations almost since the moments of their appearance, well, you’re not wrong. There’s something in Proust’s books, so humid, so perfervid, so open-ended, that has always prompted readers in both French and English to spout absurdities of a type not inspired by other works of literature. Even so squinty-eyed an old veteran book critic as Clive James, for instance, was moved to write, “Like no other book in the world, Proust’s book leads everywhere: a building made of corridors, and the walls of corridors are made of doors.” I have no idea what that means, but if it has any meaning at all, the meaning is hardly restricted to that business of “like no other book in the world.” Proust’s books are long and mind-numbingly tedious Modernist novels; if they really do “lead everywhere,” then certainly so does The Tale of Genji or War and Peace or A Dance to the Music of Time. But the curious cultification of these books extends far beyond their aesthetic limitations (the fact, for instance, that it takes the narrator several hundred pages to decide whether or not he wants to get out of bed), extends even to calling them “books” at all — the standard line of Proust fanatics for nearly a century now is that this series of novels, several of which were in scribbly-annotated manuscript form when Proust died, are actually one novel and should always be referred to that way. Such nonsense adds immeasurably to the mystique of the whole thing, and it was a mystique CK Scott Moncrieff enthusiastically embraced, which might be why so many elements of irrational overestimation have seeped into the literary world’s estimation of the translation as well as the original. The Moncrieff translation was heavily revised by Terence Kilmartin in 1981, and that revision was revised by DJ Enright in six volumes for the Modern Library in 1992. These revisions were undertaken because, to put it mildly, the original Moncrieff translation has its share of flaws. Moncrieff takes Proust’s already monstrous tendency to overwrite and expands on it, stuffing the prose with Edwardian orotundities that can make for very tough sledding even for readers who approach them with the best of intentions. This only adds to the mystery of this particular cult: it’s hard to think of another English-language translation that’s been patched up to such Frankenstein extents rather than simply communally discarded, studied for its historical curiosities but no longer regarded as a living rendition. And yet despite such excelling, Carter is constantly on hand throughout the two big, beautiful volumes he’s produced so far, snipping away our translator’s excesses, plowing through his verbiage, correcting his mistakes. 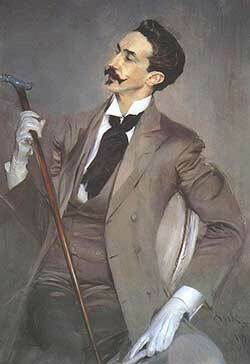 Carter insists that his sole intention throughout has been “to bring Scott Moncrieff’s excellent translation closer than ever before to the spirit and style of Proust’s original text,” and it’s left for the non-besotted reader to wonder how excellent a translation could be if it requires such consistent re-introduction to the spirit and style of the original. 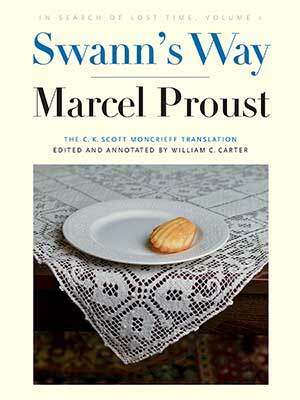 Leaving aside the sloppiness of stating that Proust was still writing A la recherche in 1927, five years afar he died, the hyperbole and sheer wrongness of claiming “that it takes the narrator several hundred pages to decide whether or not he wants to get out of bed,” and the suggestion that Powell’s magnificent “Dance to the Music of Time” has anywhere near the heft of Proust’s work, the stupidity of this commentary on Proust is exceeded only by its ignorance. The seven volumes were indeed conceived of as a single novel, which the author was still elaborating on when he died. New manuscript sources as much as changing ideas about translation have occasioned editorial revisions over the years, in both French and English editions. 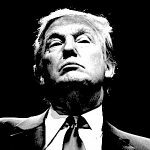 OK, you don’t like the book, but your own exaggerations and misstatements are as bad as those you rail against.